Hello! Lately I have been working on a paper flower backdrop. I am planning on using it for a photo shoot of my niece, but it is also great for weddings, parties, or just decorating around the house. I wanted this to be cheap and easy, so I just used the supplies I had at home. I’ll be posting a series of tutorials on different flowers, and my first tutorial is on a simplified rose that you can make quickly to be a filler flower. 1) Begin by cutting out a petal shape. It does not have to be perfect. It just needs to have a general petal shape. Cut 5 large petals and 6 small petals. 2) Take one small petal, and beginning from the upper corner, roll tightly towards the center and glue into place. Continue to roll the rest of the petal, but roll it loosely, until you have a slight cone shape. It should look like the beginning of a rose center on top. 3) For the rest of the small petals, cut a line about 1-2 inches at the bottom, so there are 2 flaps. Put glue on top of one flap, and put the second flap on top, so you create a corner. Do this with all 5 of the small petals. 4) Once you have done this, put some glue on top of one corner flap. Place another corner flap on it, and continue until you have a bowl shape. 5) Taking any kind of smooth stick such as a brush, chopstick, or pen. curl the edges of the petal by rolling it around the stick. You should curl most petals outwards, but also throw in a few inward curls. 6) Repeat steps 2-5 for the big petals. 7) Once you have 2 petal bowls and a center cone, it is time to put the flower together. Apply a lot of glue to the bottom of the center cone and place it in the middle of the small bowl. Hold it in place until it is stable. Apply some glue to the inner bottom of the large bowl, and place the small bowl inside. Now you should have the center cone inside the small bowl, which is inside the large bowl. It creates a layer effect and there is your rose! I hope you’ve enjoyed my tutorial and please feel free to ask me any questions! Please click here to see Flower 2’s tutorial. I’m definitely planning to check out more of your tutorials. as I can hold flowers on the wall? I’m glad i found this, i’m so gonna make these for my engagement party. This is soo easy and quick to make! Thanks so much Szasa! It really is easy! 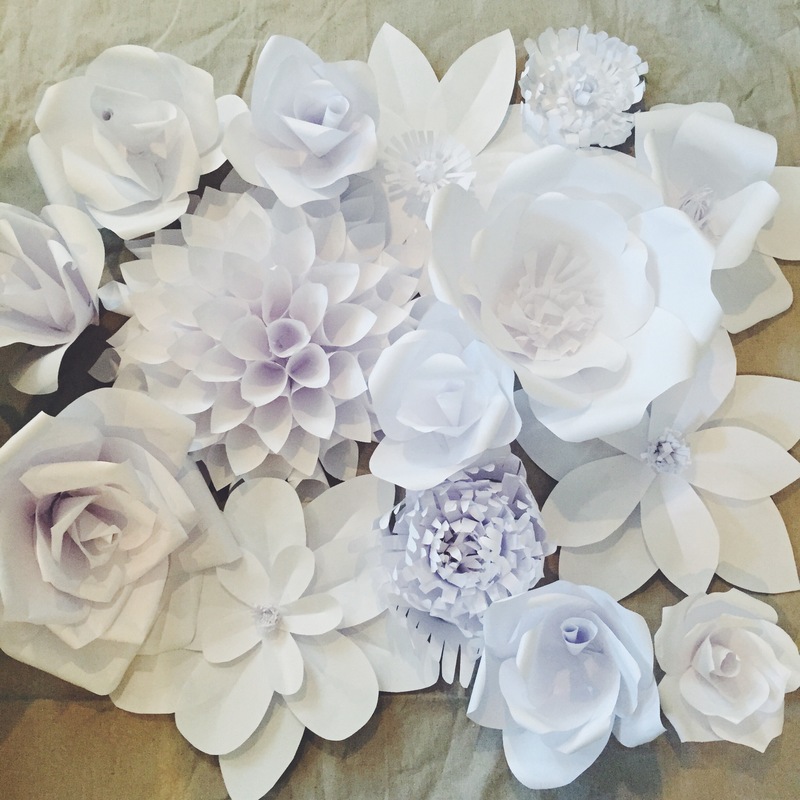 Hi I’m in love with your paper flower wall idea so pretty, I’m thinking of making it for a friend for her wedding day (I’m the maid of honour) when watching the tutorial you mention a temp plate for the rose pedals, I can’t seem to find them if you could send the link or direct me to where I’d find them. What type of paper can i use, I want to make it for my daughters 1st yr pic..
What kind of paper did you use for the flowers?